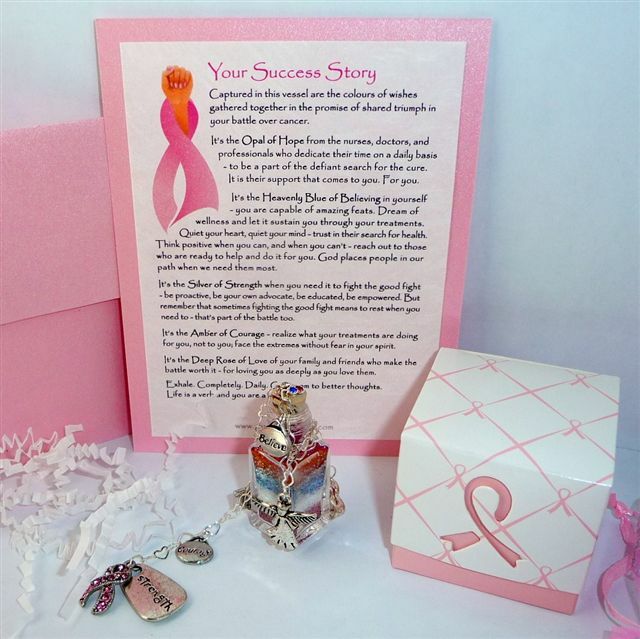 Unique breast cancer gifts don't get more magical than this gorgeous and heartfelt Captured Wish. It was inspired by Vicke Girard's book There's No Place Like Hope. (Available through Amazon). Breast cancer is a treatable, survivable disease. Your gift recipient will be touched and inspired by the layers of wishes explained quite eloquently in the verse card; layers of colors and symbolism filled with hope and deep-felt compassion. Comes complete in custom packaging, and ready to gift. Have this beautiful Captured Wish (height approx 30mm x 15mm width) vessel be your aid when you desire to put your thoughts and feelings into words that you have struggled to express on your own. Small enough to hold calm in hand or placed where comfort is needed most. When there seems to be nothing you can say, no way to articulate what's in your heart... give Captured Wishes -- wishful and filled with presence and warmth. Your gift recipient will be moved by your Wish Vessel. Each one is uniquely different than the other, just as each woman affected by breast cancer is different. Appropriate in timing, give the gift of hope, love and strength: Captured Wishes.